Life has moved along as it always does, and lately it's been dragging me along behind it. This spring, with Senior years of high school and then college looming, I decided to make a job change. I got lucky and found my dream job at a local hospital, as the coordinator for their large volunteer department. I've always fancied myself talented in the realm of concierge, and that's kind of my role--matching people up with their skills to fit needs within hospital departments. I could also describe myself as a guidance counselor, but believe me, it brings on a whole new meaning when you are dealing with "Seniors" in the literal sense of the word. In addition to the hospital gig, and at about the same timeframe, I found a second part-time job at a local attorney's office, right around the corner from the hospital. Initially, I anticipated taking one job or the other, but as it turns out, my poor judgement took over and I accepted both. Truthfully, I like each of them equally well, and the 2 part-time statuses allow me more flexibility than 1 full-time job would. This summer has been a bit of a transition since my kids have been home without me. But my big guy has his own car, and has been a champ at chauffeuring his sister around, so it has worked out quite well. We are taking off with the adventure of Senior year in high school, and I'm sure to be sobbing the whole live-long 180 days of my boy's last months as a kid. Pictured above is a car that a co-worker of mine has offered to our friends that had the car accident on their way to our house on Thanksgiving afternoon. You can read details in the post below, but they were coming to our house to bring us a pie for Thanksgiving ::sob:: It has been gratifying to see how our family, friends and neighbors have stepped forward to help us raise the money to provide them with a new car. 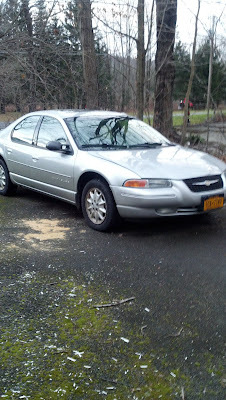 We are collecting money to pay for a few repairs, purchase new tires and get the vehicle inspected and on the road. Since Friday evening, we have already raised approximately $650 of the $1000 that we need, through the generosity of those who felt impressed to give. Every gift has value and we are so humbled by the willingness of everyone who has given what they can. We visited our friends Sunday afternoon so that John could check on their wounds from the accident and make sure that they understood all the discharge instructions from the hospital. We were able get better acquainted with them to hear what it was like for them living as a Khurdish family in Iraq. It was sad to hear about the life and job they left behind and their struggle to establish their life in the U.S. They were amazed at how our community of relationships has stepped forward to help strangers. In this season of thanks and giving, know that there are people that you can bless beyond measure. If you don't have a giving opportunity already chosen, we would be honored if you would join with us in helping our friends obtain the transportation they desperately need. We would like to be able to complete the repairs and DMV registration process and deliver the car to them by this weekend. Any money we raise above the $1000 that we need for the car will go to pay for a $625 bill that they received from the towing company that hauled their destroyed vehicle away. If we receive more, we will purchase 2 cords of wood for them to burn this winter, as they use a wood stove to heat their home. There are several ways to give. First, you may donate via credit card or Paypal through the Paypal link below. If you prefer, you may send us a check directly. If you would prefer your gift be more personal, we can provide you with the home address of the family. Feel free to share this post, as we never know who is looking for an opportunity to give. For anyone who donates directly through us, we will be sending an accounting of how much money we raise, and specifically what it has been used for. It will be gratifying to relate to each of you how we have come together to bless this family. Blessings on each of you, and blessings on our friends whom we have grown to love. Thursday afternoon about 2pm, just as we were putting the finishing touches on our Thanksgiving dinner, my sister glanced up and saw a car coming down the road in front of my house. It slid, flipped twice and landed on its roof. Thankfully my hubby is a medic and my mother is an RN and they rushed out and began helping the family. We quickly realized that the victims were friends; my son wrestles with one of the boys in the car. Dad, and three of their five sons (including a 2-year-old toddler) were coming to bring a pie to our family for Thanksgiving to thank us for driving their son back and forth to wrestling practice with our son. Their family is about as different from mine as can be--we are Christian; they are Muslim. They are a family of 5 boys and 2 parents; I have one son, one daughter. They are a Kurdish family who fled Iraq about a dozen years ago during the war with Saddam Hussein; I have lived in in the US my whole life. But we also have much in common. We live in the same community, our children attend the same school, we each love our families and children, we are each grateful for the blessings of friends. Thankfully, God was watching over them all; there were no life-threatening injuries. However, this family is going to face challenges in the upcoming months with the loss of their only car, medical bills from the Dad's crushed hand and time off work. If you are looking for someone to bless this holiday season this would be a great family to give to as they are hard workers, loyal friends and grateful recipients of lives spared from death as a result of this frightening accident. It reminds me of the Laura Story song, Blessings, that says "What if your blessings come through raindrops, what if your healing comes through tears." I want to be a blessing to this family. I have located someone willing to donate a vehicle to this family, but we need to raise approximately $1000 for some repairs, new tires and inspection. If you would like to help in a practical way during this holiday season, hit the "Donate" button, and we will gratefully put your donation toward the expenses to provide a new car to this family. Any money raised above the car expenses will be given directly to the family in cash or gift cards for food and living expenses. 2) I skipped running for the 2nd day in row - partly because of time constraints (the mall was out of town) and partly because I am still nursing a stiff neck/back since my 5-miler. Tomorrow I'm running regardless, so hopefully it will work itself out before then. 3) "You have been entrusted with an incredible pain"...MaryBeth Chapman in Choosing to See. I sat in Borders book store for about an hour and read several chapters of this book while Chickadee was shopping with her pal. I was embarrassed when I started laughing out loud and then had to hunker down when I started to bawl...definitely one of the best books I've read in a long, long time. I will always think of my life hurts in a different light after reading about her experiences. She's a lot like me. Although it's been a while since I've posted, believe me, life has continued to move in a forward direction! 1) My girlie and I volunteered on Saturday to work at the first annual ALS Walk to Defeat Lou Gehrig's disease. It was awesome to have my daughter work alongside me and along with some other good friends. 2) I ran my first 5-miler since my half marathon back in April. I have really slacked off this summer and confirmed to myself that need goals and a plan in order to stay consistent. I did 3 5Ks this summer, but I didn't run much more than a 3-mile training run once a week until this week when I resumed a more regular schedule. I was happy to cross a 5-miler off my list--it was a mental hurdle I had been avoiding. I have a 10K scheduled for Oct 2. This will be the first 10K race I've run--it's going to be a challenge because it's a very hilly course. Well, the half marathon is over, and I am still alive and kicking! I owe so much gratitude to each of you who offered moral support and financially helped me reach my fundraising goal to support World Vision. 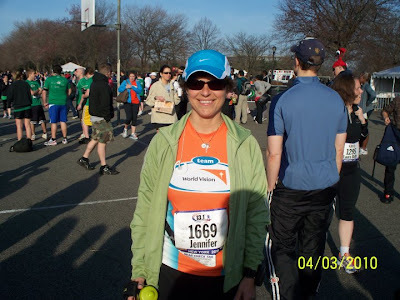 I found out a few weeks before the race that I was in the "Orange Laces Club" and I received a pair of bright, neon orange shoe laces to wear in my shoes on race day - for raising over $800. In fact, my goal was to raise $1000 and I am happy to report that I exceeded that goal, raising over $1,060 for clean water wells to be dug in Africa. John and I drove with our kids to New York City on Friday, April 2 and headed straight in to the heart of Manhattan to a running store located in the World Financial Plaza to pick up my race packet. In the envelope was my race number to wear on my shirt on race day and my racing "chip" which is a tag that you loop through your shoe laces to clock your individual race time. I also received my orange laces to wear in my shoes, for reaching a fund raising milestone of $800. After picking up my packet, we headed over to our hotel, located near LaGuardia airport and Flushing Meadows Park, where the race was located. The kids were able to enjoy some pool time with some friends, as I was racing along with three other girls from my town and two of them had brought their families along as well. By dinnertime, my aunt had driven up from Washington DC with a friend of hers to stay overnight and support me while I ran. We had a nice dinner out and then headed to the hotel for an early bedtime. Unfortunately, besides pre-race jitters keeping me awake, we had some unruly hotel neighbors, and even a 3:00 a.m. call to the front desk didn't quiet them down. I got up around 7:00 a.m. without having more than a few winks of sleep. I had brought my own breakfast along, and this allowed me to get dressed and eat while John took the kids down for breakfast. Our hotel offered a shuttle service over to the race site, and we all caught the bus and were in Flushing Meadows Park by about 7:45 a.m. At 8:15 a.m., we met at the World Vision tent where we got race instructions, and a team picture. We also were able to walk together with other World Vision racers and our friends/family to the start line. It was such a blessing to have family and friends there to give encouragement and support since I have done all of my training alone. My one goal for the race was to be able to complete the whole 13.1 miles without having to walk. My pace is not fast, but I figure if I'm moving faster than I can walk, then I am technically running My "ideal" time goal was to finish in 2 hours 30 minutes, but I figured it would take me closer to 2 hours 45 minutes since the temperature was unseasonably hot and the race was several hours earlier in the morning than I usually do my long training runs. I got off the starting line with a friend of mine who has been running for a few months longer than me, and stayed with her till about mile 7, even though we were going quite a bit faster than my last few training runs had been. It was great having someone to run alongside, but about mile 7, I reverted to my usual pace to make sure I would be able to finish the race running. Around mile 10, the heat and fatigue began to set in and fortunately, my sweet husband was at the sideline with a fresh bottle of water and lots of encouragement. I also began to review the long list of names of people who donated to the race in support of me, the many emails, text messages and phone calls that I had gotten to wish me luck and it was just the thing that really boosted me through the last few miles. 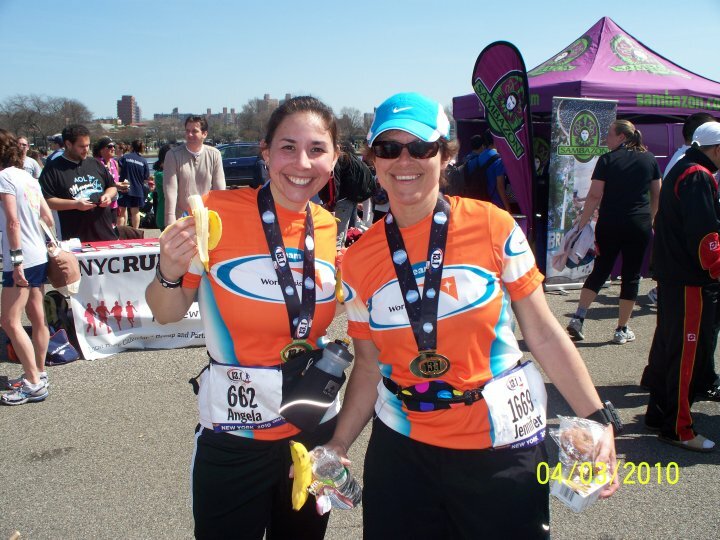 The course was set in the beautiful Flushing Meadows Corona Park, the site of the US Open & the Mets stadium. The weather was sunny and breezy and there were a lot of areas that had tree shade. The real bonus that the course was virtually flat, except for a bridge or two that had a bit of a rise going up and slope going down. I was able to finish the race in 2 hours 32 minutes and I was very happy that I met my goal of not stopping to walk. I was also pleased that I was very close to the finishing time that I wished for myself! I want to thank each of you again for the encouragement and support that helped make April 3rd a day that I won't forget. It's almost here! One week from today, my half marathon will already be over. I began running in earnest in September, worked up to 3 miles, then 5 and then started a training schedule in January to get me ready for the half marathon. So far, I have done long runs every weekend, my longest being 12 miles. I thought it was gonna kill me, but I survived, and I'm sure I will be fine on race day. The jitters have definitely set in and I am worrying about everything from whether I'll get a good night's sleep the night before to whether I'll have to stop and use the bathroom halfway through ;/ Most people probably don't need to fret the way I do, but I can conjure up a myriad of things to worry about. When I chose this race, I decided to join the official fundraising effort for World Vision. There is no minimum requirement for an amount to raise, but I decided to try for $1000. I truly didn't think I would come close to raising $1000 but I am thrilled to report that I have raised $940 as of this morning! I even qualified for the Orange Laces Club - I will be given a pair of neon orange shoe laces to wear on race day if I want (anyone who raised $800 or more qualifies). I am most excited about having my family on the sidelines to cheer me on. I have walked in 2 half marathons and run a 5K but I've never had anybody there to watch. I am so thankful to my hubby for picking up the slack in our household through these months when I've been preoccupied with training and/or exhausted, and I'm blessed that he thinks it is important to come along to see me accomplish this goal I have set for myself. My one goal is not a time limit...I simply want to be able to run the whole course without needing to stop to walk. If my times from some of my longer runs are any indication, I won't be fast. But I just want to keep moving at a pace that is faster than I can walk! I'll report back in when I'm finished! PS--If you decide you'd like to help boost me to the last few dollars of my fundraising goal, click the link to my personal fund raising page and you can donate on line.